At the beginning of 2017 my lovely new next-door neighbour moved in. 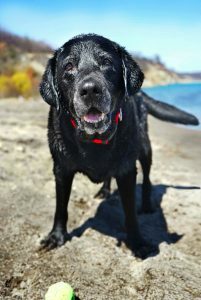 Best part, her roommate: a sweet, grey-muzzled 10 year old black lab named Nixon. 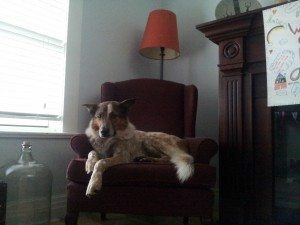 Being able to work from home and having an older dog of my own, Nixon became our almost daily guest and a frequent, sprightly walking companion. Nixon, the quintessential lab with a social and exceptionally playful nature would insist on a hig h intensity workout every time we went out for a walk. I was always impressed by his boundless energy, however it was very clear that he was far from being in an ideal physical shape. Putting little weight on his right hind leg, his movements generally seemed stiff and cumbersome, especially after a long walk. Everyday activities like getting up even a few flights of stairs, hopping onto a couch or chasing after his favourite ball, were clearly a strain; jumping into a car, not even an option. His hind legs covered in small scabs and scars had a hard time keeping up with his youthful exuberance. It was obvious that advancing age and heavier build finally caught up with him, but only physically. In his mind he’s as playful and goofy as ever. Something had to be done. Prior to Nixon’s first chiropractic appointment, my 8 year old dog Ollie had a few regular, very well received treatments from Dr. Mishka. Knowing he’d be in great hands, now it was Nixon’s turn! During his first visit the doctor went over his history and condition. Sadly, he may have been quietly dealing with pain and discomfort for several years. I remember hearing, “His back is like a log”. He’s been seeing Dr. Mishka every week for over a month. After his initial appointments and several adjustments he slept and rested considerably more than usual. Although not unexpected, I was somewhat concerned at first, but after two days of rest his energy returned…and THEN SOME! It’s so heartwarming to see him on our daily walks. He’s so happy! His form and balance have clearly improved and he’s much more stable on his hind legs, on which he doesn’t nibble as much. With a big grin on his face, he always leads the way during our outings, insists on fetching a hundred times, has less trouble walking up stairs and walks around with handsome swagger I’ve never seen on him before. His condition is still improving and I continually notice positive changes I was only hoping for. I know we can’t turn back time, but seeing him with a rejuvenated sense of mobility is indescribably gratifying. 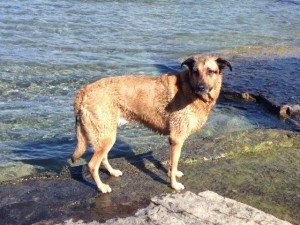 I’m so thankful for the treatment he receives from Dr. Mishka, I only wish that we knew about her sooner and that more people are aware that this could be a life-changing therapy option for their loving furry companions. With our most sincere appreciation and gratitude (and a few slobbery kisses from Nixon) we want to extend many thanks to Dr. Mishka for her ongoing dedication to improving the lives of Nixon, Ollie and countless other dogs, cats and horses. 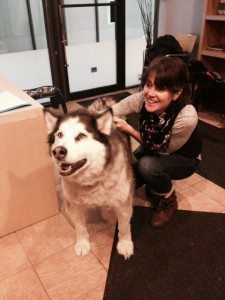 We have been going to Dr. Mishka for about a year now at All About Dogs. When we first went, it was solely due to Renée’s suggestion that Smidgin may benefit from an adjustment. She had been doing agility classes for a year, but really hadn’t ran particularly fast, and often had a funny little prancing gait as she “ran.” When Smidgin was a little tiny puppy she jumped (or geronimo’d) off an A-frame in Todoredaca Park – she jumped from the peek and landed on the grass chin-down and tail up with her front paws splayed to the sides. She was stunned, initially, and a little scared but appeared fine as she shook it off and trotted away – she ran right back up the A-frame but was successful in descending the right way the second time. No harm done, I thought. 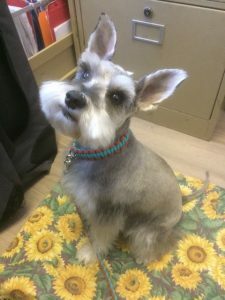 Additionally, Smidgin (a 10lb mini-schnauzer) had a tendency to approach people to say hi, but would then hesitate and back up if people tried to pet her. She would often do the same when it was me trying to pet her. She had always done that, so I didn’t really think it was an issue, and chalked it up to her being timid, and conflicted as to whether she trusted people enough to let them touch her. She also hated puppies that would use their paws to play. Fast forward a couple years to last year, when Smidgin is four, and we have our first Chiropractic consultation. Dr. Mishka’s workup and history taking was highly professional and thorough. She gasped when I mentioned Smidgin’s high-dive off the A-frame as a puppy. As Renée had suspected, Smidgin’s entire neck and back and hips were all out of alignment and Dr. Mishka did quite the adjustment to little Smidgin. 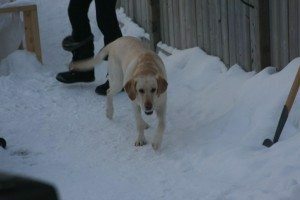 Smidgin was great through it, and the way Dr. Mishka handled her was gentle and kind. Dr. Mishka listed the plethora of issues little Smidgin had, and what she had adjusted. She also asked me to take mental notes of any differences I noticed for when we saw her the following month for our follow-up appointment. The Wednesday after our chiropractic appointment, we had agility class. And little Ms. Smidgin was on FIRE! 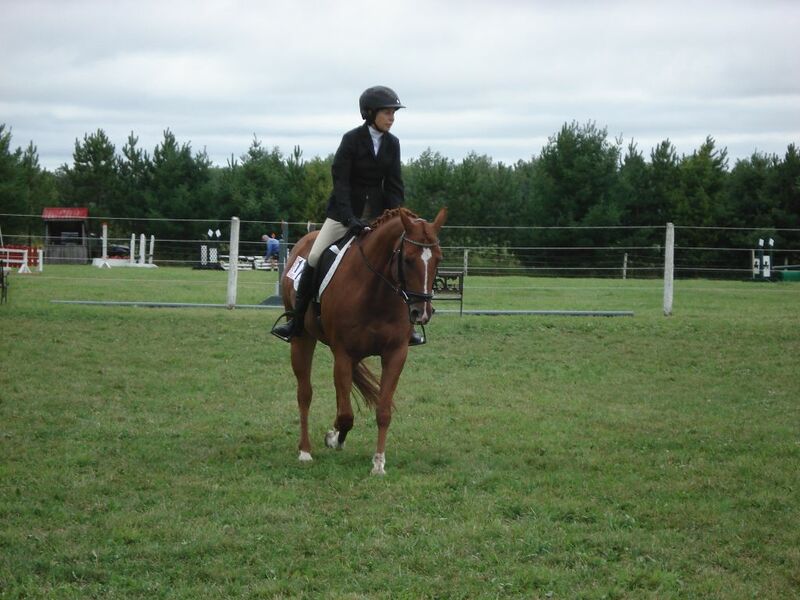 She was running full out, no more prancing and trotting through the course, she was running, and loving it. Such a huge and immediate change. Even Renée said “Smidgin is a different dog, did she have an adjustment on Saturday?” We also had a fun outing at Cherry Beach that week, where Smidgin – completely out of character – went up to a City of Toronto worker who was on lunch and said hello, and put her paws on his knees and requested that he pet her, in fact, he was able to pick her up and sit with her and pet her on his knee. I was dumbfounded. She’s been letting people love her up ever since. Since that initial chiropractic appointment we do our best to go once a month to keep her in top form and aligned. I continue to see her personality shine as she lets more and more people into her comfort zone. She now has started asking people to say hello and pet her. Often pawing their knees. She loves a good massage now as well. She runs more and is more confident in herself. I believe that she had been in overall discomfort since her Flying Walenda jump from atop the A-frame. I believe she didn’t want people to touch her because she was in “pain” or “discomfort” but she never gave any outward sign – no crying or whining – to indicate that she was in fact in pain. For a couple years we all thought she was just timid and insecure. She, in truth, is neither. She is becoming more confident all the time. She is outgoing and has learned to love agility now that she can run freely without discomfort. Now, when she begins to prance or has refusals on course, we know it’s time for her to see Dr. Mishka! Smidgin and I highly recommend that you bring your puppy/dog in for a consult with Dr. Mishka. You’ll see some amazing results too! I must admit that when it was suggested that my horse, Ruby, might benefit from a chiropractic treatment, I was skeptical. However, it became apparent as our dressage lessons progressed that Ruby was having physical difficulties with movement patterns. She was particularly stiff and sore on her right lead. She was therefore fussing and becoming resistant to my aids. My coach very strongly suggested that I have Dr. Mishka do an assessment and, if necessary, an adjustment. Well, what a difference this has made for me and Ruby. Following Dr. Mishka’s adjustments, Ruby is so well balanced and comfortable that she just flows through her dressage movements. I have become a fan!! Ruby is now on a four to five week schedule with Dr. Mishka, and we are both thoroughly enjoying our rides. Thank you Dr. Mishka! You have made a huge improvement to Ruby’s ability to perform and her wellbeing. After witnessing the changes myself and also having my students tell me they can feel the improvement in the horses, I can confidently say that chiropractic care can make a huge difference. I just wanted to thank Dr. Mishka Thomson for extending the life of our 15 year old maltese poodle- Buddy. After sustaining some persistent leg injuries and being completely atrophied on one side of his leg, Buddy was unable to move. He had slipped 2 discs in his back and the animal clinic pumped him up with pain-killers and anti-inflammatories. Had it not been for Dr. Mishka’s careful and consistent professional chiropractic treatment – he would not have had his life exten ded for at least 6 more months. Thank you so much for making our precious dog as comfortable as possible and doing everything possible to help us enjoy more time with Buddy. My husband and family will never forget your compassion, gentleness and professional care. You cared -when everyone else gave up. Woody is a 15 year old Alaskan Malamute. He had back surgery last April. For the first 2 months, he couldn’t walk without assistance. Slowly he recovered to moving on his own but I could tell he was having some pain and discomfort issues. Dr. Mishka was recommended to me. After our second treatment, I was astonished to see a huge improvement in Woody overall. He even jumped in the car on his own one time. Something he always needs assistance with. Woody was running slowly and chasing squirrels on our walks. I notice a huge difference in him following all of his treatments; he is happier and more mobile. I try and get a treatment done every 2 weeks. If he misses more time, I see he is in discomfort. I would highly recommend Dr. Mishka. She has a superb way with the dogs. Woody is normally grumpy when handled but not with Dr. Mishka. I think he really knows she is helping him out. Thank-you for all your excellent care!!!! 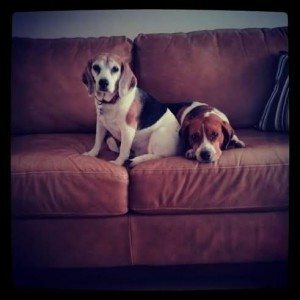 My 12yr old beagle, Sweetpea started seeing Dr. Mishka for chiropractic adjustments in 2014 for a muscle strain in her groin. After a few treatments Sweetpea’s gait and comfort level improved significantly. After approximately a month there were no clinical signs of her injury. Sweetpea had always walked up the stairs slowly and it seemed to be labour intensive for her. As I had adopted Sweetpea as a senior, I thought this was just how she took stairs. After seeing Dr. Mishka for a few adjustments for her muscle strain she started and continues to take the stairs with ease. Sweetpea also had some minor incontinence issues. Unexpectedly, this also started to improve after just a few treatments. I was blown away that chiropractic adjustments could have such an impact on Sweetpea in all these weak areas she had. Mishka is always so welcoming and handles Sweetpea with such care and knowledge. Thanks Dr.Mishka for improving my old girls life!